You are currently browsing the archives for the Gig Posters category. Currently showing at the Richard Goodall Underground Gallery in Manchester is an exhibition of posters by Jay Ryan and Diana Sudyka. We’ve been fans of Jay’s work for ages and there are a fair few Jay Ryans adorning the walls of the Indie Credential residence. However, his wife, Diana Sudyka, has been quietly building her own impressive portfolio of gig posters over the last couple of years and, though we went to the exhibition opening on December 1st with the express intention of not buying anything, we were quite taken aback by the quality of her work and ended up splashing out on her beautiful Low poster (below) for their Nottingham Rescue Rooms gig earlier in the year and getting it personalised by the artist herself. It was either that or the typically brilliant Jay Ryan Decemberists poster to your left but then we’ve already got three Decemberists posters in our collection. The images on this page don’t remotely do justice to the posters themselves so if you’re in Manchester at any time over Christmas then get along to the Richard Goodall Underground Gallery on Thomas Street in the Northern Quarter and see them in the flesh. File under diana sudyka,Gig Posters,jay ryan,News,richard goodall gallery. 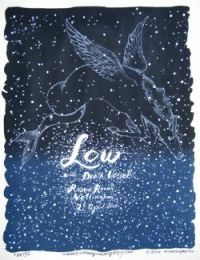 Regular readers of this blog, if there are any, will know that we are big, big fans of The Decemberists but might not know that we are also avid collectors of gig posters and have been since we stumbled across the brilliant Gig Posters website about three years ago having spent a good year trying to find some original and appropriate artwork to adorn the walls of the conjugal home. As luck would have it one of Europe’s only gig poster art galleries, The Richard Goodall Gallery, was on our doorstep and soon works by the likes of Patent Pending, Tara McPherson, Print Mafia, David Witt, Jay Ryan and Emek were filling up those empty spaces on our walls while simultaneously creating even bigger empty spaces in our bank account. 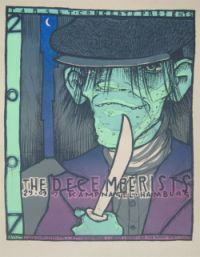 The current exhibition at The Richard Goodall Gallery, on Thomas Street in the Northern Quarter, Manchester, is of posters from The Decemberists’ recent European Tour. The posters were commissioned by Richard Goodall himself and the artists include Jay Ryan, Emek (pictured, above), Guy Burwell, Justin Hampton, Small Stakes, Diana Sudyka, Leia Bell and Drew Millward. When JustHipper saw the exhibition she couldn’t help herself and, after a good few minutes of umming and aahing over the Jay Ryan and the Mike King (pictured, right) she plumped for the latter as it was for the Manchester gig we’d recently attended. I would urge you, if you haven’t already and if you live in the vicinity or are passing through, to visit the gallery and see the posters in the flesh as the pictures shown don’t do them justice at all. Then spend an hour or so rummaging around the thousands of other posters in the gallery basement and see if you can get out of there without being parted with a reasonably sized chunk of your hard-earned. The exhibition runs until April 2007.